biggerThe city has no water and no electricity. The U.S. claimed that 2,500 ISIS militants were in the city when the fighting started. In the end the U.S. let at least 500 of those leave the city and move further east to fight the Syrian army. It also said that only 30 civilians were killed in its attack. That is of course nonsense. At least 2,000 dead bodies have been recovered so far and 6,000 more dead are recorded as still lying under the ruins. There will be more. The city administration has no equipment and money to recover them. 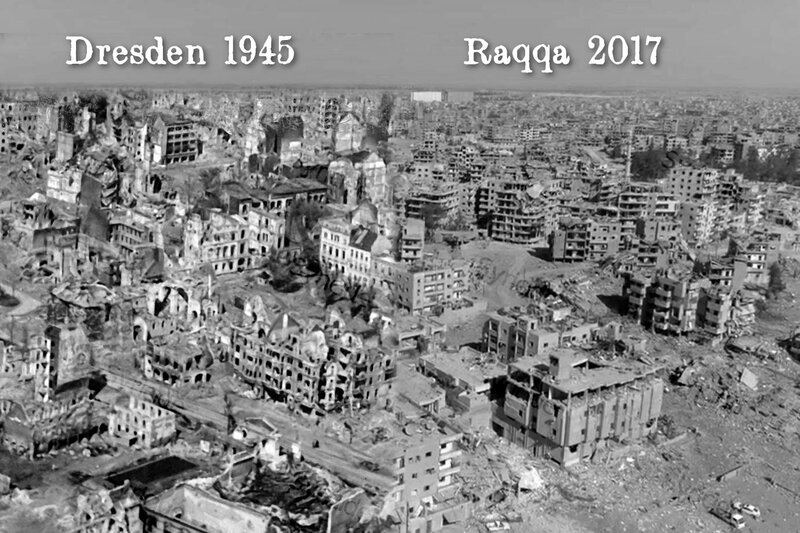 The U.S. is unwilling to spend any money for the city it destroyed and the Kurdish warlords who now occupy the city are incompetent and have no interest to help its Arab inhabitants. The population that has returned is hostile towards the U.S. and the Kurds. It wants to get back under Syrian government control. The research service of the German Bundestag published a report today which concludes that the U.S. led attack on Syria on April 13 was evidently in violation of international law.